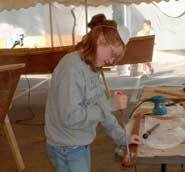 The Youth Boat Building Program is held at the New Hampshire Boat Museum for boys and girls ages 12 and up. Students will build their own boat from a kit they select from August 1 through the 12th, weekdays from 9am to 3pm. The kits available for purchase are a one-person canoe $695, a one-person kayak $995, and a Bevin’s Skiff that will accommodate two adults $1,195. Students will be taught the safe use of hand and a limited number of small power tools, to assemble the kits. At the end of the session, a special launching on Lake Wentworth will be held to celebrate the completion of the student's craft. All students must complete and mail in an application and medical waiver form which can be found on the NHBM’s website (www.nhbm.org). Scholarships are available for youth who could not otherwise participate due to financial considerations. Scholarships are only available for the one-person canoe. For scholarship consideration, please complete and return the two application forms, the medical waiver, a written recommendation from a teacher or guidance counselor, and your two most recent tax forms (form 1040) to be considered for a scholarship. We will notify you to let you know if your child has been accepted to receive a scholarship. For questions call the Museum at 603-569-4554 or email museum@nhbm.org. Deadline for applications and pre-payment must be received by June 1st.